If you choose to visit Barcelona during winter, then you’re in for a real treat. As the temperature cools off, the atmosphere warms up with colourful lights illuminating the streets, delightful delicacies around every corner and a calendar full of fantastic activities and events for you to enjoy Christmas parades. Here we give you a short guide to Barcelona this season to help you decide just how to spend your time in this winter wonderland. Both the 6th and 8th of December are bank holidays in Barcelona and the rest of Spain, due to the Día de la Constitución and the Día de la Inmaculada Concepción. Although bank holidays are generally quiet in Barcelona, as many shops and businesses are closed, these two holidays can be a great opportunity to wrap up warm and witness the city in full festivity without frantic Christmas shoppers. Instead, the city focuses itself around Christmas markets, churches, and restaurants. Barcelona is hands-down one of the best places to be to bring in the New Year. 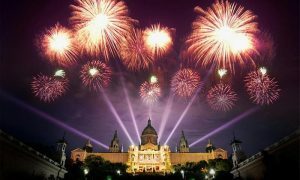 Whether you prefer to dance the night away at cool clubs like Razzmatazz and Shôko or spend the night watching the Montjuïc Magic Fountain and exciting firework display in Plaça Espanya, Barcelona will definitely not disappoint! No matter what your decision may be, be sure to partake in the Spanish tradition of eating 12 grapes – one each time the clock chimes – as you countdown to 2019, to symbolise luck in the upcoming year. On the night of January 5th, Barcelona celebrates the arrival of the Reyes Magos (the Three Kings) with a parade. Children and adults alike line the streets to see The Kings tour a massive 5km around the city centre and catch candy from the various floats. Starting at Port Vell, Balthasar, Gaspar and Melchior arrive on the Santa Eulàlia boat around 4:30pm, and travel across the city, ending near the Montjuïc Magic Fountain around 9:30pm. This is a tradition not to be missed! Three Kings Day on 6th January is a magical day, much like our Christmas Day. Families and loved ones come together to enjoy a feast, open gifts, and play holiday games. 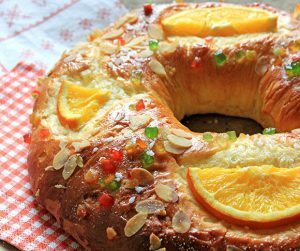 If you’re in town on this day, try some Roscón de Reyes. This sweet cake is topped with a paper crown and candied fruits, and is filled with cream, plus two hidden elements: a fava bean and a small king figurine. The tradition goes that if you find the king in your portion, you get to wear the crown. If you find the bean, you have to pay for the dessert – good luck! Barcelona’s oldest and most famous Christmas market has over 280 stalls! This is the perfect place to find some of the most unique Christmas trinkets and enjoy some fun festivities like carol singing and nativity scene building. The market is located in front of the Catedral de Barcelona in the Gothic Quarter and is sure to bring you plenty of holiday cheer! The 231st edition of this massive outdoor fair will run from November 30th until December 23rd this year. Read more here, or on the official website. 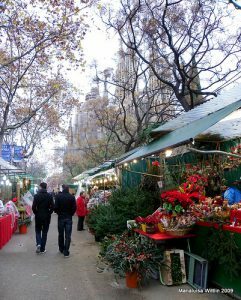 As its name suggests, this Christmas market is located in front of Gaudí’s iconic Sagrada Familía in the Eixample district. This traditional Christmas market first opened in 1962 and offers more than 150 stalls that occupy the pavements that surround the square facing the Sagrada Família’s nativity façade. The stalls sell Christmas trinkets such as decorations, figures and crafts, as well as traditional food products such as nougat, dried fruit and chorizo. This year’s edition runs from 24th November to 23rd December – don’t miss out! Celebrated for the first time in 1877 and also known as ‘Sant Tomàs i Reis’, this is one of Barcelona’s biggest Christmas markets for toys, gifts and sweets. 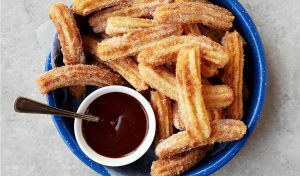 As well as this, one of the main characteristics of the Fira de Reis a la Gran Via is the Xurrerias (stalls that sell churros)…what’s not to like? Located on Gran Via de les Corts Catalanes between Carrer de Muntaner and Carrer de Calàbria, this festive market runs from 20th December to 6th January. In December, the people of Catalonia enjoy their own holiday traditions, as well those that may be more familiar to visitors. Some of our favorites are the Tió de Nadal, aka the Caga Tió, and Caganers. December 8th marks the date when children begin ‘feeding’ the Caga Tió, which is best described as a log with a painted smiley face, wearing a blanket. On Christmas Eve, kids attack the Tió with sticks until it eventually ‘poops’ presents. The Caganer is a small ceramic figurine with his trousers down that is normally hidden in nativity scenes. The tradition of this little guy began in the 18th century and he is said to bring luck by fertilizing the earth. 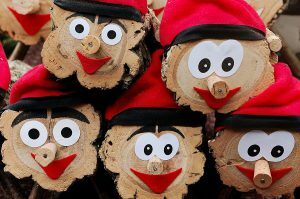 Top Tip: Pick up your own Tió de Nadal and Caganer at the Fira de Santa Llúcia! Warm up this winter with some traditional Spanish dishes! We recommend Sopa de Galets, a flavorful soup full of giant pasta shells, which is traditionally eaten on Christmas Eve. On December 26th, the day of Sant Esteve, enjoy cannelloni, made from left-over meat from Christmas Day. If you prefer the sweeter things in life, sink your teeth into some turrón (nougat in various flavors) or some some delicious churros con chocolate – long, thin sugary doughnuts accompanied by a thick hot chocolate sauce- our mouths are watering at the thought! 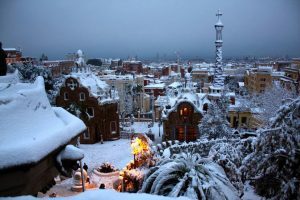 Though Barcelona is known for its warm weather activities, this beautiful city is equally as exciting in the wintertime! Take a day trip to Grandvalira Andorra resort or La Molina in the Catalan Pyrenees to enjoy skiing, snowboarding, snow biking and igloo building. Andorra also has its own smaller-scale Christmas markets! Alternatively, if you prefer staying off the slopes, there are lots of ice rinks dotted around Barcelona to master your ice skating skills! 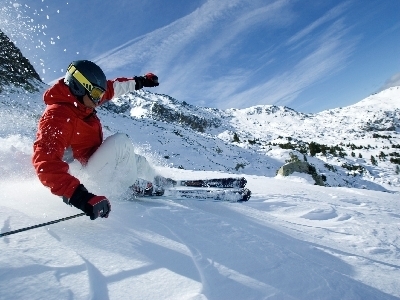 Take a look at our blog post on the top 5 ski resorts near Barcelona. If you’re on a family holiday in Barcelona this winter, be sure to look into Les Festes de Santa Eulàlia. This celebration hits the city in February and is centered on fun activities for youngsters. Here you can see the parade of the Gegants (giants), as well as the Castellers (human towers), too. Plus, there will be plenty of family workshops and activities going on around the city, as well as in museums, during the festival. 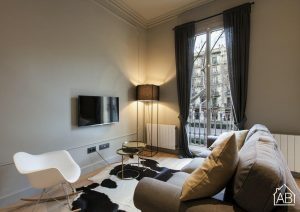 So, if you’re planning on spending some time in Barcelona this winter, at AB Apartment Barcelona we have plenty of centrally located apartments and apartments for large groups, perfect for a cosy winter city break! Psst… our check-in office is open 24 hours, 365 days a year, meaning you can even spend Christmas Day in Barcelona! Coming to Barcelona this winter? Drop us a comment below and let us know what exciting activities you plan to take part in this season! Be sure to follow our facebook and instagram to keep up with all things Barcelona!